Instructions below are for Windows Vista, 7 and 8. Click Here to jump to Windows 10 System Restore instruction. 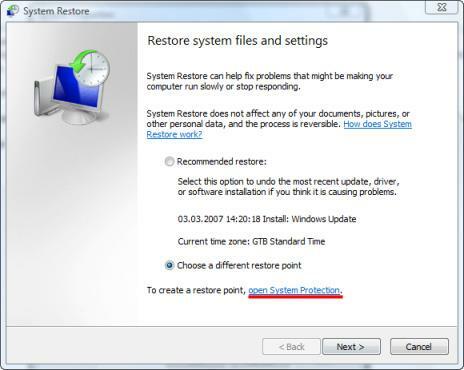 There are several ways to find System Restore. The easiest is to type "system restore" in the Start Menu search field and press Enter or click on the search result. The main System Restore window will open. You have two options: to restore your system to a previous restore point or to create a new restore point. First, we will show you how to create a restore point. In the lower part of the System Restore window you should see a link saying open System Protection. Click on in. A new window called System Properties will pop-up. Here you can select the drives which will be included in the restore point. To select them, simply click in the appropriate check-boxes and then click the Apply button. 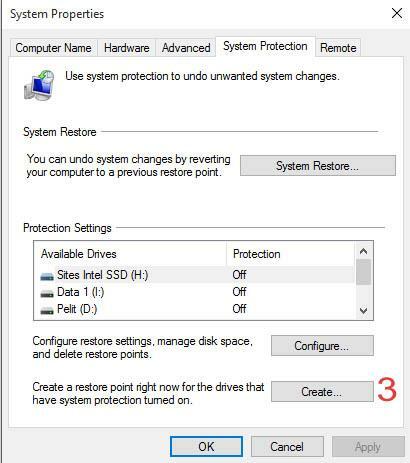 Now you can create a custom restore point for the selected drives. To do that, click the Create button, type the name for the restore point, and click the Create button once again. 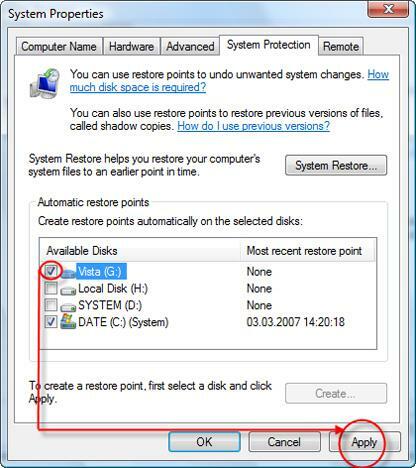 Windows Vista will create the restore point for the drives you selected. After a while you will receive the confirmation that the restore point was created. 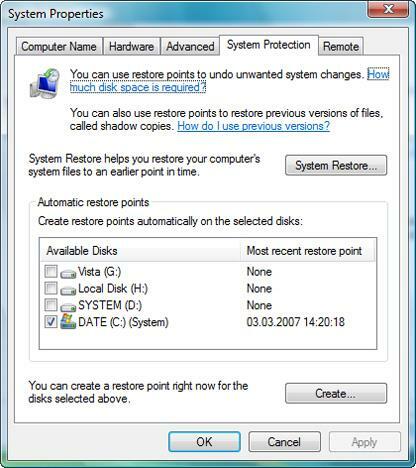 To restore your system to a previous state you can use the recommended restore point or you can choose a different one. The Recommended restore option will restore your system to the most recent restore point. If you select the second option, after you press the Next button, you will see a list of available restore points. Select the one you prefer and press the Next button once again. Now you are asked to confirm your restore point. 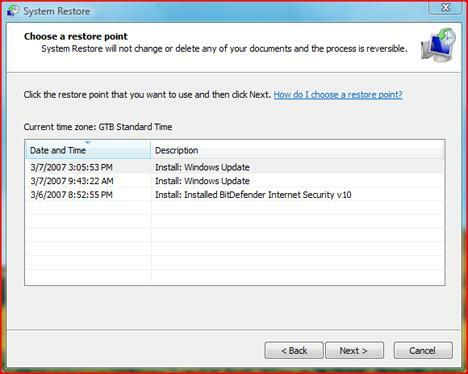 Click the Finish button and System Restore will restart your computer to apply the necessary changes. When the process is finished your system will be back to the state you selected. Windows 10 also creates system restore points automatically. But it's also more safe if you create restore points periodically yourself. Now "system properties" box opens. Make sure that you are in the "system protection" tab. 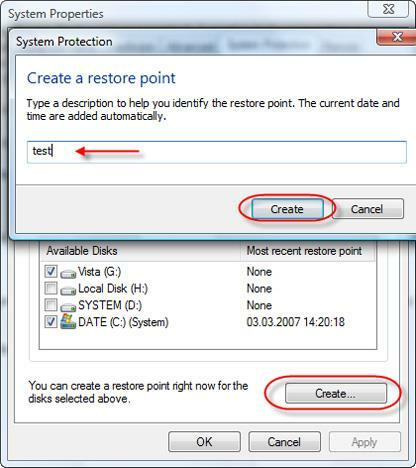 Click the "create" button (3) at the bottom of the box to create a new system restore point. One you've clicked the "create" button, a new box open where you can name your restore point. You can name it anything you want and after that click "create" and you're good to go. It will take a few minutes for the process to complete. 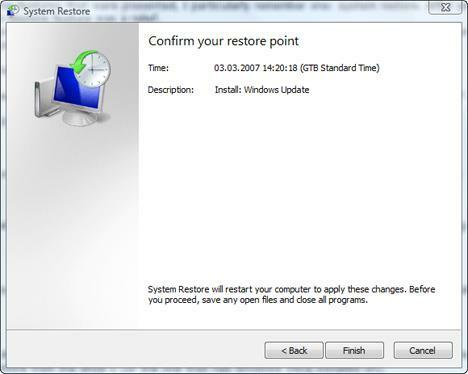 Now you can use that restore point to restore your Windows 10 to this current stage in the future if anything goes wrong. Like in the steps above, start by going to the "settings" and typing: "system restore" in the search box and then click "create a restore point". Make sure that you're in the "System Protection" tab and now click the "System Restore..." button. From there you can choose the restore point you would like to go back to. In case something goes terribly wrong. Your Windows 10 starts freezing, locks up or is terribly slow, you have the option to restore factory settings which will take your Windows back to the state when it was first turned on. To do this, first click the windows logo in the bottom left corner of your screen and then select "Settings". Now click the "Update & security" icon and then "Recovery" from the menu on the left. There you have the option to "Reset this PC". If you want to proceed, click "Get started". It gives you two options, to keep your personal files or to remove everything in case you want to make a complete factory reset. When you've made your choice, Windows will then guide you through the process. NOTE Restoring your factory setting is the last option. Not only it reinstalls your operating system, it might also REMOVE all your files from your computer. So make sure that you have a full backup of your whole computer before you do this! I know I have many restore points but I m not getting the second option to choose different restore point. I can only pick last restore point which is when vista downloaded an update.. I want to choose even older date before the update took place. I lost System Properties in Win 10. How can I get back so I can use system Restore?